While Bruce will eat anything, Neeko and Faolan are known to be treat snobs. I am nearly always on the lookout for soft treats that appeal to them, and contain quality ingredients. Zuke's Jerky Naturals and Genuine Jerky treats fit the bill. The Jerky Naturals all contain the specified protein as the primary ingredient, along with apples, veggies, and beneficial herbs. They are also grain-free, and yeast-free, which is important to me because of Bruce's yeast allergy. The herbs are rosemary, turmeric, and sage. Rosemary is a known antioxidant, and is widely used as a preservative. Sage is a natural antimicrobial, and is said to be good for gum and digestive tract health. Turmeric has gained notoriety because it has been proven to alleviate pain, particularly arthritic and cancer pain, in both humans and animals. The Jerky Naturals are decent-sized, soft, and easily broken into smaller pieces. They have a strong, but not unpleasant scent, which makes them more appealing to dogs. Unlike many other soft treats, they do not feel greasy, which is a bonus for me. The Genuine Jerky treats have a traditional jerky texture/feel to them. They can be broken into smaller pieces with just a tiny bit of effort, if one wishes to do so. The Barbecue Beef Recipe treats smell amazing, and I was tempted to try it myself! Based on the quality ingredients, I would be comfortable doing so. Yes, she really is that big, and she really wanted the jerky. In summary-appealing, meat-based, grain-free treats that contain quality ingredients. What's not to like? Find Zuke's on Facebook, Twitter, and Instagram. 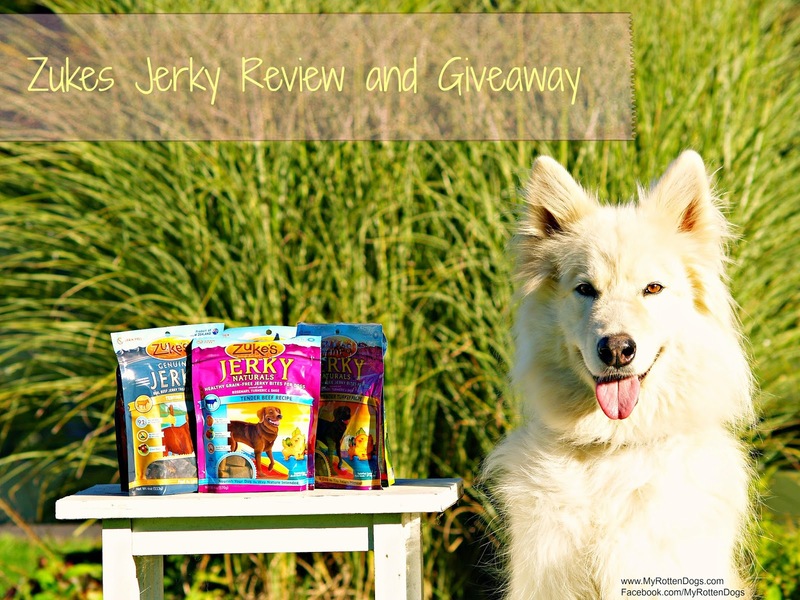 I have three bags of Zuke's Jerky Treats to giveaway to one winner! Enter using Rafflecopter below. Giveaway open to residents of US and Canada, excluding Quebec. This post and giveaway are sponsored by Zuke's. All opinions are strictly my own. Those look super tasty! We have never tried Zukes, but have heard a lot about them from peoples blogs. I am definitely entering the giveaway! We love Zukes treats! Thanks for hosting a great giveaway! My dogs will eat anything, but I like the non greasy part. I think my dogs would like these because they love any kind of treat, they are not picky at all and I like that these are good for them. Wow a pocket mug. Well it had to be good then. Have a wonderful Wednesday. We have a dog with some pretty serious food allergies but these sound great and safe for her! Those are such cute photos!! The girls love Zuke's, too! I use the jerky naturals *all* the time for training- they're perfect for my needs. But I know my dogs would like the genuine jerky, too! If your snobs like them, well, maybe mine might too! Keep up the great blogging - it's one of my favorites! You have had some really nice giveaways on your blog and we have been lucky enough to win two things, so we are not going to be greedy and sign up AND Ms. Flea from the JOnes blog brought us a lot of treats. Mom said a sharing heart is the best kind of heart. Schooner and Skipper loves Zukes because of the YUMMY taste! Anything having to do with treats they will like. Having a treat is the highlight of their day! My dog would love them! I love that they are healthy and not like some of the crap you can buy! My Dog's Would Love Them Because They Are Flavorful. My dogs like Zukes because the treats are made of meat.